HANOI, Sept. 20 (Xinhua) -- Vietnam's first urban railway, constructed by China Railway Sixth Group Co. Ltd, started its trial operation on Thursday. The Cat Linh-Ha Dong elevated rail line in Vietnam's Hanoi capital is scheduled to run on a pilot basis for three to six months before commercial operation which is expected to start before lunar new year festival (early February 2019). Urban railway is a new means of transport in Vietnam, transporting a large number of passengers in a convenient and comfortable way, Nguyen Ngoc Dong, Vietnamese deputy minister of transport, said on Thursday when he took part in checking and supervising its trial operation. The trial operation is a milestone in the urban railway project before the rail line is put into use, he stated. "I think that technical aspects will be OK. The only issue is management work, how to build up apparatus, master techniques and procedures needed to operate the rail line, and organize transport connections," the deputy minister said. Hanoi has a big population, so it should develop at least three urban rail lines and more bus routes to link its urban transport systems, he stated. Vietnam and China are cooperating to implement some programs and projects on railway development and connection. "China has developed urban railways very quickly," and the country currently has up to 27,000 km of high-speed railway, accounting for nearly one half of the world's total, the deputy minister said while comfortably sitting in an air-conditioned green train to participate in evaluating its trial operation. From Thursday, 13 four-carriage trains are scheduled to run on a pilot basis transporting passengers for a total distance of more than 13 km through 12 stations in the three districts of Ha Dong, Thanh Xuan and Dong Da in 30 minutes. Trains run on both directions and they depart at interval of 10 minutes. Each train stops at each station for one minute. An air-conditioned train, whose length is some 80m, can accommodate up to 1,000 people. Each carriage is some 19m long, 2.8m wide and 3.8m high. After taking a short ride, the Vietnamese deputy minister got off the train at Van Quan Station, and entered a control room full of computers and technical boards on its walls. One of the big boards bears a Vietnamese sentence "Diagram of Electricity Supply System for Urban Railway in Hanoi, Vietnam". Another board features buttons, switches and name tags which say "Escalator", "Anti-fire pump" and "Smoke-discharging fan". Chinese technicians in the room, mostly handsome guys wearing short-sighted glasses, glued their eyes to computer screens, while Dong and Vietnamese reporters listened to presentations about technical issues. According to Vu Hong Phuong, vice head of the Cat Linh-Ha Dong railway project management unit, the railway's trial operation is of significance because it ensures safe and sound commercial operation to serve people in the next few months. "We are checking the smooth combination of equipment in the whole system. We are also completing final steps such as decoration and equipment, including stairways, escalators and elevators," Phuong said. Regarding personnel for the urban railway, a number of Vietnamese people have been sent to China for training, and others have been trained in Vietnam, Phuong said, noting that they will gradually master relevant technologies and techniques to well manage, operate and maintain the whole railway system. "The trains' average speed is 35 km per hour," although they can run at twice of that speed, he said, noting that the short distance of some 1 km between two adjacent stations make it hard for trains to travel at their maximum speed. Inside one train on Thursday, many local reporters were busy taking photos, shooting videos, or livestreaming elevated trains and their trial operations. Major Vietnamese media outlets, including Vietnam News Agency and online newspaper VnExpress posted many nice photos and videos about the trains on the move. Hu Suojin, commercial counselor of the Chinese embassy in Vietnam, said Vietnam's first urban railway, constructed by China Railway Sixth Group Co. Ltd using Chinese ODA and Vietnamese reciprocal capital, will help ease transport pressure in Hanoi, contributing to the r all-round cooperation between the two countries. In August, during a test run of Cat Linh-Ha Dong rail line, many Vietnamese people were invited to board trains. They were eager to see designated areas for people with mobility disabilities. Seats for the elderly, pregnant women and children are highlighted in yellow color, while steel holders are there to make sure safe positions for standing passengers. "The train is clean and cool. Unlike roads with traffic lights and frequent congestions below, it runs fairly fast and smoothly. 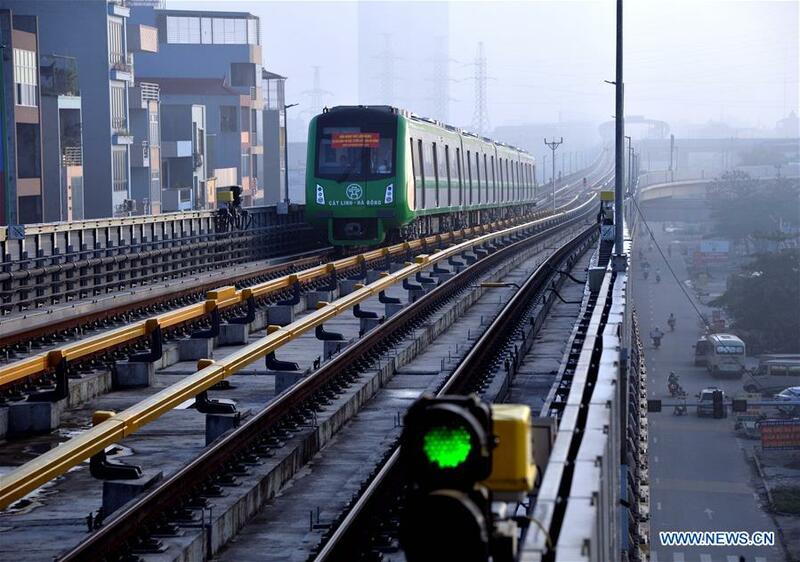 I hope more urban rail routes like this will be built in Hanoi and other localities," Nguyen Anh Duc, an 11th-grade student of Cao Ba Quat High School in Hanoi's Gia Lam district, told Xinhua. Duc, whose father works as a driver for the Cat Linh-Ha Dong urban railway project, said he is studying hard to be admitted to the Automobile Technology Faculty of the Hanoi University of Industry. "I want to develop advanced vehicles for both personal use and mass transport. I do not want people to think that going on roads in Hanoi is a nightmare. I want daily trips are relaxing," the young man boasted, grinning from ear to ear.